Note that there’s no option for getting a rack without fenders. Normally, we think of fenders as protection from road splash, and a rack as a way to carry gear. 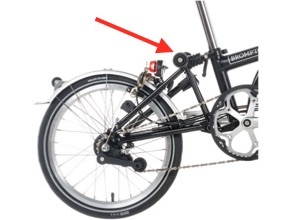 However on a Brompton, these options have additional implications for storing and transporting the Brompton when it’s folded, that may not be obvious to someone who has not used the bike before. To make these implications more clear, we’ll go through the versions in reverse order. Each Brompton bike comes supplied with two firm rubber rollers attached just behind the point where the rear triangle releases from the frame. These give the bike stability when folded, and allow the bike to be rolled. How well the bike rolls depends on some additional factors. This configuration includes the front fender, and a rear carrying rack with the rear fender attached to it. In addition to providing extra carrying capacity, the rack is equipped with two more rollers, one on each of its outer corners. together with the two rollers attached to the frame, this becomes a stable platform on which the bike “sits” in the parking position. In the folded position with the handlebar up, the four rollers facilitate the towing of the bike, as you might do when walking through an airport concourse, for example. Best uses: This version is great for users who need to walk with the bike regularly through train terminals and airports, or for use in grocery stores. The rack can of course be used to carry cargo, but any load must be removed prior to deploying the parking position or folding the bike. If you plan to use your Brompton on extended trips, where you’d benefit from additional cargo space, go for the rack. If you primarily use it for daily commuting, the front luggage tends to work better, and the rack is strictly optional. This setup has the same front fender as above, but in the absence of rear rack means that the rear fender is attached to the bike with slender steel struts. The top of the L-version rear fender sports a single small roller. When the bike is fully or partially folded, this third roller forms a triangle base with the existing frame rollers. This is stable enough for resting the bike, but because this third roller is small, and supported on a fender that has a little “give”, the rolling function is somewhat compromised in the L-version. Best uses: All-weather commuting. You can save a little weight by forgoing the rack, but don’t skimp on the fenders. They’ll keep the bike, and your garments, cleaner. This is the most pared down configuration. Without either the rack or the rear fender, the bike has a slight tendency to tip when folded. It does not roll well on the two standard rollers attached to the frame. Best uses: If you want the most light-weight option, and don’t require the rolling function, this is the way to go. If you’re getting a superlight Brompton, excluding these add-ons will definitely enhance the weight savings. This is a fine choice if you use the bike exclusively in dry weather. The three options are not easily interchangeable and at a minimum require additional hardware, or even complete new kits. For example, you can’t go from L to R simply be adding the rack. The R-version rear fender is different than the L, and must be purchased together id you are adding a rack. Conversions are possible, of course, but can be more involved and costly than you might think. Please check with us to help you determine what will be needed. The stock rollers included with the Brompton are OK, but if you find yourself wishing for smoother, more efficient rolling, you may want to upgrade to EZ Wheels. These are larger and slightly softer rubber wheels, sold in pairs, that will significantly improve your Brompton rolling experience.